Another longtime restaurant has closed. Lupe’s Azteca Mexican Food in Redlands/Loma Linda has shut down. The restaurant had been in operation since 1952. A recent visit found a giant notice posted on the front door indicating that the restaurant was permanently closed. Loma Linda University students will have four chances this month to win $25 gift certificates to two nearby eateries, courtesy of Omnitrans sbX. Winners will be chosen every Friday in October, and will get a certificate to either Napoli Italian Restaurant or BK Subs. Reservations are now being taken for the first Let’s Dine Out Grub Club event of 2013. The group dining-out experience will take place from 5 to 8 p.m. Sunday, February 24, at Napoli Italian Restaurant, 24960 Redlands Blvd., Loma Linda. Cost is $25 per person, which includes a multi-course dinner (featuring a trio of appetizers, salad, a pair of pastas, a selection of entrées, sides and a couple of homemade desserts), soft drinks (beer and wine are available for additional cost), tax and gratuity. You definitely won’t go home hungry! We’re excited because it’s going to be our very first Grub Club event (and hopefully not the last)! Reservations are a must, since these popular events often sell out. For more information, or if you want to reserve your spot to join Allan Borgen, Jeff Williams and the rest of the Let’s Dine Out crew (and us) simply click here. Head over the jump to check out the full menu. Loma Linda’s Kool Kactus Cafe has served its penultimate lunch service. 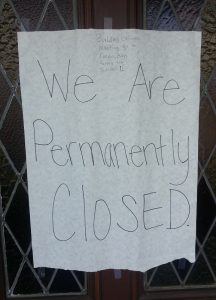 The longtime Mexican food restaurant quietly closed about a week and a half ago. Owner Carole Inman closed the restaurant in order to focus on her existing catering business, aptly named “Catering by Carole,” and a new sauce and seasoning business. A visit to the old Kool Kactus website now leads to the catering business. Fans of the cafe have one last chance, however, to get a fish taco, or perhaps a squash burrito or spinach mushroom enchiladas. Kool Kactus will have its grand finale from 11 a.m. to 3 p.m. Friday (November 9), and will have its regular menu, including its usual Friday-only fish tacos. Kool Kactus Cafe is at 24957 Redlands Blvd. We all know how Loma Linda feels about McDonald’s, but how will food trucks affect their “Blue Zone” status? We’ll find out tomorrow (January 14) as Spreen Honda hosts three food trucks: Rancho Cucamonga’s Suite 106 Cupcakery, Me So Hungry and Coolhaus. The event will take place from 12:30 to 3:30 p.m. at the auto dealership, 25050 Redlands Blvd. Regular readers of this blog know how we geek out when it comes to the Coca-Cola Freestyle 100-plus flavor soda fountains. We’ve driven to Orange County to experience it when it was first available. We wrote about the first Freestyles being installed in the Inland Empire. We’ve mentioned new locations as we discover them. On Tuesday, Coca-Cola announced that Burger King will roll out Freestyle machines to its company-owned restaurants nationwide. That’s more than 850 restaurants, according to an article from Nation’s Restaurant News. Burger King already has already installed about 120 machines. That makes them the third (and largest) chain to announce chain-wide rollouts, following Firehouse Subs (which are not in the Inland Empire) and Five Guys Burgers and Fries (the Redlands, Mira Loma and Moreno Valley locations have one). First it was November, then it was January, now it’s anybody’s guess. According to this story on The Sun‘s Web site, the opening of the Loma Linda fresh & easy has been pushed back to who knows when, due to the shriveling economy. The building at the corner of Mountain View Avenue and Redlands Boulevard is complete and ready to be stocked (it appeared that way when I drove by last year), but there’s no telling when it will open. Spokesman Brendan Wonnacott indicated that they generally don’t announce new store openings until about a month prior, which means the Loma Linda store won’t open until late February at the earliest. Also in opening-date limbo are stores in Rancho Cucamonga, Ontario and the two stores in Rialto, not to mention planned openings in Mira Loma, Pedley, Riverside, Moreno Valley, Calimesa, Beaumont, Corona, Menifee and Lake Elsinore. Stay tuned to Dine 909 for more updates.